An Orca whale gives us a great photo opportunity off Northern Vancouver Island in British Columbia, Canada. While watching in the waters off Northern Vancouver Island in British Columbia, Canada, you can not ask for a better photo than this. This female Orca shows off almost her entire body as she surfaces for air after surfing in the wake of a whale watching boat. An Orca whale has many different behavioral traits and some days you may spot whales resting, feeding, breaching, spyhopping, tail slapping, leisurely swimming with the rest of their family or racing through the vast ocean trying to get somewhere in a hurry. Wake riding or surfing by an Orca whale is a special treat but you must always be ready to snap a photo as an Orca Whale off Vancouver Island may surface anywhere at anytime. This orca is a member of the Northern Resident Killer Whales, which as far as we know, usually travel from Alaska down to Campbell River. 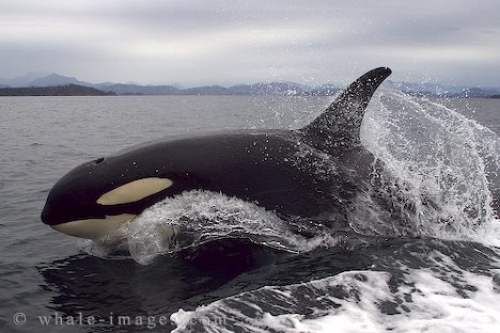 The best time to view Orca whale families off Northern Vancouver Island is between late June and October. This of course depends a lot on the salmon runs and where the best feeding areas may be. On the rare occasion you might be skunked on a whale watching excursion but a majority of the time there is at least one Orca pod traveling not too far off Northern Vancouver Island in British Columbia.